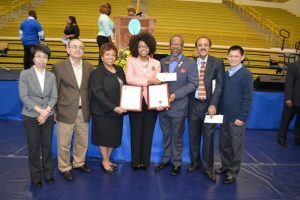 April 2, 2015 – Two Fort Valley State University students recently received scholarships for their outstanding academic achievements inside and outside of the classroom. 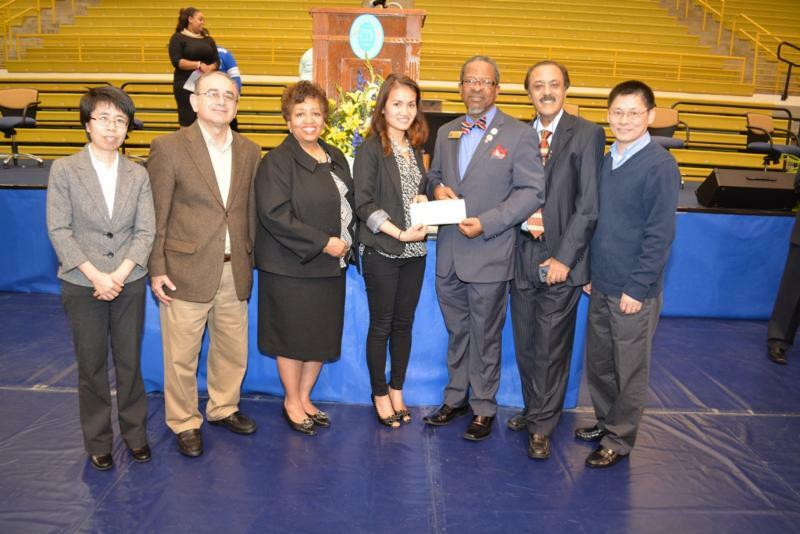 Ashley Davis, a senior majoring in mathematics, and Thuy-Duong Nguyen, a senior majoring in computer science, were awarded a $400 Fariborz Asadian scholarship on March 19 inside the Health and Physical Education Complex after the Honors Convocation Ceremony. FVSU president Dr. Ivelaw Lloyd Griffith and provost and vice president for Academic Affairs Dr. Jessica Bailey gave the students their awards in the presence of faculty members Dr. Masoud Feizi, Dr. Jianmin Zhu, Dr. Xiangyan Zeng, professor Gholamreza Keihany and administrative assistant Mary Pollard. Ashley Davis, a senior majoring in mathematics, (center) receives the Assadian scholarship at Fort Valley State University’s annual Honors Convocation. (From left to right) Associate professor of computer science Dr. Xiangyan Zeng, professor of computer science Dr. Masoud Naghedolfeizi, Fort Valley State University mathematics senior Davis, FVSU president Dr. Ivelaw Lloyd Griffith, professor of mathematics Dr. Gholamreza Keihany, and associate professor of mathematics Dr. Jianmin Zhu. The Fariborz Asadian Scholarship was established in 2013 by the Department of Mathematics and Computer Science faculty to commemorate one of its most beloved professors. Asadian was a distinguished and dedicated mathematics professor in the department who diligently served the institution and his profession for 21 years before his untimely death on Jan. 7, 2013. The award goes to the best student in mathematics and best one in computer science. All recipients of the scholarship awards are encouraged to further their education in the STEM field of their choice. Are the recipients required to be math majors? Seniors? What are the requirements for the award? Bullet them out…. For details, contact Keihany at (478) 825- 6725 or keihanyg@fvsu.edu.